Adrenalin Levels: How many Candles does your dog have burning? Has your dog ever seemed to explode and ‘go off’ for no obvious reason when faced with something that is usually not an issue? 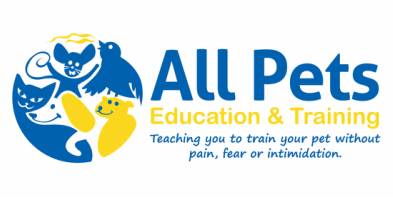 In the dog training world, we use words such as ‘arousal’, ‘threshold’ and ‘reactive’. Arousal – is the energy level of the dog. Threshold – is the level that they are comfortable at, and then the level that they ‘go off’. When your dog is over threshold, they literally can’t think. Reactive – this is the term used when a dog has ‘gone off’. The barking, lunging dog that many of us have seen is in a state of high arousal, in which it has gone over threshold and is now considered reactive. There is often a lot more going on for your dog than just the event they’re reacting to. Events earlier in the day, or even in the previous few days, can heighten your dog’s arousal levels. Often when dogs are in these heightened levels of arousal, their ability to cope can be reduced. What’s important to remember, is this isn’t just a dog thing. We do it to. ​You’re making your morning coffee, and spill the coffee down your front. Not only have you now soiled your work uniform, you have also burnt yourself, and lost a few precious minutes in your morning ‘get ready for work routine’. Okay, you’ve dealt with that and are out the door, but now you are running late, traffic is heavier, and someone cuts you off. You arrive at work late; your boss makes a snide comment. You realise you left your delicious lunch on the table at home. The printer jams, just as you are trying to print an important document. You are now finished work, but your boss makes you stay back and catch up the 15 minutes you were late (despite missing lunch). You are hungry, and have had a shocking day. You are grateful to leave, and arrive back at your car and notice that there is a new (yet small and barely noticeable) ding in your driver’s door. You arrive home, and your partner who is home before you says “what’s for dinner”? YOU EXPLODE! Consider yourself, your arousal levels are heightened, you have just gone over threshold and are now considered reactive. Things can build up for our dogs in just the same way. Taking the time, to consider what your dog may have found stressful (even the small things). Sometimes dogs will go into ‘shutdown’. This is the exact opposite of what you are usually looking for – and they almost look calm. Shutdown can be described as an absence of behaviour – meaning they don’t do anything – they don’t take treats, they don’t move, they don’t respond. Dogs in shutdown are very stressed. What might be stressing your dog? So why do we talk about Candles? We can use the Candle Analogy. Everything that your dog finds stressful (even the tiniest bit) is now called a stressor. Some stressors are worth 1 candle, others 2, some 3, a couple 4, right up to a 10. The worth of each stressor will vary from dog to dog. For some approaching another dog on a walk will barely register a 1, but for a small dog scared of other dogs, having another dog, especially off lead rush up to it whilst it is on lead and without means of escape, will easily equal the 10. Now consider these candles are all placed under a pot of water. How many candles will it take for the water to boil (become reactive)? Now imagine a pot of water is your dog. One candle under a pot of water won’t make much difference on its own – however, ten candles underneath may cause the pot to boil over! 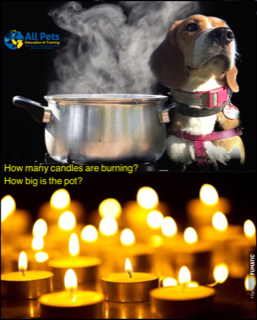 The number of candles each individual dog can handle before reaching boiling point will vary. 1. You drop a pot on the kitchen floor in front of your dog. Your dog gets a fright and jumps back. 2. Then, the postman comes. For your dog, this is a very stressful event. Your dog races outside and runs up and down the fence barking uncontrollably and doesn’t even hear your call her. 3. Then you yell at her to be quiet when she comes back to you after barking at the postman. 4. Later in the day you take her for a walk and a dog runs out of a yard at you and your dog. The other dog barks and growls at your dog. You yell out and pull your dog away from the loose dog. 5. Then on the way home you come across a person walking a dog across the street, normally this is nothing that would phase your dog in any way but now suddenly your dog rears up, strains on the lead and whines and barks uncontrollably. You can’t understand why they’re ‘overreacting’ about this. You walk home, completely deflated and disappointed and think your dog can’t learn or listen to you, is aggressive to other dogs and will never be able to be calm around other dogs on walks. You now have 20 candles burning too!! The adrenalin and cortisol that are released in stressful events are controlled by the sympathetic nervous system. These chemicals were once needed for survival, but now only serve to amp up our dogs. Dogs can go from arousal to aggression in an instant. The increased cortisol affects the breathing rate, heart rate and blood pressure as they all go up. Digestion stops, and vigilance goes up. Adrenaline and cortisol can change the thought processes in the brain so the dog is more reactive to stimulation, rather than thinking before responding to a stressor. Muscles are fuel so that your dog can fight or flee to ensure its survival. High levels of adrenaline are associated with heightened vigilance, anxiety, and dogs may be more reactive to small stressors. It can take up to 6 days for these levels of hormones to come back down to normal! If a dog is constantly living with this heightened state of arousal, it is very difficult for them to be calm, and think about their responses. Your dog can become physically sick and physiologically maladaptive if this goes on long enough. The dog will often over react to situations, or react inappropriately. How can I reduce or manage my dogs Adrenaline levels? Well, the first part is obvious. Where possible reduce the exposure to things your dog finds stressful. This will help their adrenaline levels stay low. However we must also teach them how to cope with these stressors gradually and positively. So, when these stressors do happen one after another, you know what to do and how to help your dog cope. Crate training - Teaching your dog to be happy in a crate is a very useful tool. It can help dogs to switch off and aid in reducing stress levels. It is like your dog’s own bedroom, where they can go to relax with nothing bothering them. Don’t forget to have Couch days. Allow your dogs to have a day or two when they don’t have to go out for a walk, don’t have to participate in training, don’t have to play games, don’t have to deal with visitors. Remember if your dog barks/lunges at other dogs when on a walk, taking them for a walk every day, and having them bark/lunge is just allowing them to practice this behaviour and isn’t showing them what you would prefer. Reducing their exposure to the stressor, and training them in a control environment will be much more effective. Arthur, N., 2009. Chill out fido!. 1st ed. Wenatchee, Wash.: Dogwise Pub.